Happy Bloggers Challenge Friday! Thanks to those who played along with last weeks Button(s) Challenge. This weeks challenge is Christmas, Hanukkah or Kwanzaa. 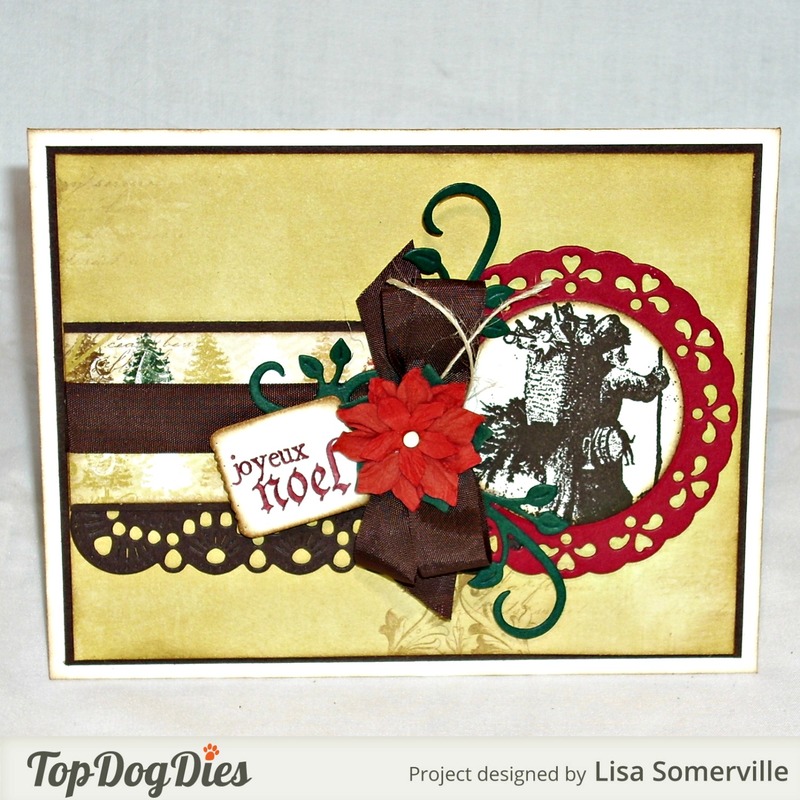 My Christmas card is created with Artistic Outpost Stamps, Top Dog Dies and pattern paper from Bo Bunny. 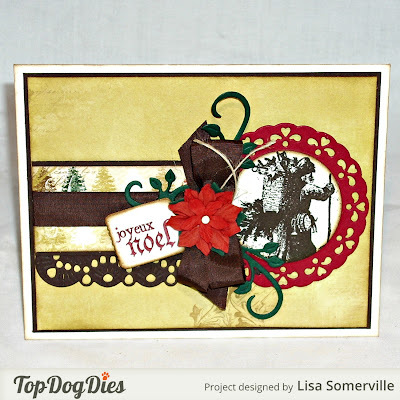 I stamped the Vintage Santa image from the Artistic Outpost Snowy Woods plate in Espresso ink on a Vanilla panel, sponged the edges and layered it on a Cherry Cobbler doily that was die cut using Top Dog Dies Cherish Doilies and Tags Set (TC027). The Espresso scallop edge under the middle panel was die cut using the Darby Doily & Tags Die Set (TC025). After die cutting the Doily, I simply measured the length and width of the center panel I wanted to adhere over the doily and cut it to size. To embellish I added a stamped tag die cut from Vanilla card stock using the smallest tag from the Darby Doily & Tags Die Set, Vintage Brown Seam Binding, a Prima poinsettia flower and flourishes die cut from Hunter card stock using the Leafy Flourishes Die Set (TC016). If you'd like to play along with this weeks Bloggers Challenge, please link back to this post on your blog and mention you created your card for the Bloggers Challenge Christmas/Hanukkah or Kwanzaa Challenge. Please add your link using the Link Tool below, your link should be a direct link to your Bloggers Challenge Post, use your name as the Title. Please do not link to cards that were created prior to the challenge date. Entries not linking properly, or backlinked will be removed. If you have the captcha enabled on your blog, please consider turning it off, as it makes it so much easier to leave comments. So pretty, Lisa! I really like the elegant frame around the image. Love that Santa! Beautiful use of the dies! Happy Friday! What a lovely vintage Christmas card, Lisa! Love that image! Hi Lisa! I just applied for the Top Dog Dies Design Team and that's how I found your blog. You have lots of great things to see and enjoyed browsing through your blog. Thanks for all the inspiration. I'd love to have you as a follower if you'd like to stop by my blog, and I look forward to visiting yours again soon. P.S. I run a challenge blog, and I would absolutely LOVE to have you play along with us. Our challenges are always Anything Goes (family friendly) and we offer some really amazing prizes every week. I'd love to have you stop by to play along. great color combination on this card...and crud...I played but forgot to link up this week-oh well!